In advance of the G-20 meeting in Seoul, the International Energy Agency (IEA) released its annual World Energy Outlook, a 738-page analysis of the global energy market. The report discusses the market for various types of energy and summarizes the energy policies of the world’s governments, devoting two chapters to raising the alarm about government subsidies for fossil fuel usage. Just five months earlier the IEA had published in conjunction with OPEC, the OECD and the World Bank a stand-alone study of governmental subsidies to energy in advance of the G-20 meeting in Toronto. That joint report found that no systematic effort has been undertaken within the last decade to estimate subsidies to fossil-fuel production over a wide range of countries. In both reports, the IEA expresses its opposition to energy subsidies if they encourage the production or consumption of fossil fuels, but the United States does not come in for criticism because most nations subsidize fossil fuels far more than the U.S. does. Yet the Obama Administration has devoted considerable effort in policy proposals and public relations to eliminate not only the few subsidies that fossil fuel providers currently receive, but to withhold from them the ordinary tax treatment of business expenditures that many corporate taxpayers benefit from. Not that the federal government offers no energy subsidies, but the vast majority is funneled to the producers and consumers of wind, solar and other forms of non-fossil-fuel energy. Because tax policy is one way governments subsidize or punish energy production and consumption, here we consider how U.S. tax policy stacks up versus the rest of the world in this increasingly important area. The new IEA report classifies energy subsidies into seven general categories: trade instruments (such as tariffs), regulations (such as direct price controls), tax breaks, credit to producers (i.e., loans), direct financial transfers (such as low-income energy assistance), risk transfer (government shifting legal risk from one party to another), and energy-related services provided by government below cost (such as energy research that is used by energy companies). The policy justifications that governments cite for these subsidies are various and contradictory. The IEA report cites five general justifications for subsidizing energy: (1) alleviating energy poverty, (2) boosting domestic supply, (3) redistributing natural resource wealth, (4) protecting employment, and (5) environmental protection. While each of these arguments for subsidizing energy has its own justifications, they are obviously in conflict. Giving away gasoline to low-income people and protecting the employment of coal miners are government policies difficult to reconcile with environmental protection. Fossil fuels can be subsidized in a variety of ways. One common method is to subsidize consumption by end users, often by making gasoline and heating oil artificially inexpensive. Another is to subsidize energy companies, often as an inducement to produce energy in a certain way, perhaps a safer way or a cleaner way or a way that maximizes employment. The IEA report does provide a breakdown of subsidies by type of fossil fuel – coal, natural gas and oil – but there is no breakdown of total subsidies between the dollars targeted to consumers so that they can buy more fuel and those targeted to producers so that they can make more. However, despite the limited data available, it is well known that among the nations offering massive subsidies, most are for consumption. Iran, Saudi Arabia, Russia, India and China rank 1-2-3-4-5 as the nations offering the largest subsidies in billions of dollars. Measured as a share of gross domestic product (GDP), the ranking resorts somewhat, with Uzbekistan, Iran, Turkmenistan, Iraq and Saudi Arabia ranking as the five biggest subsidizers. 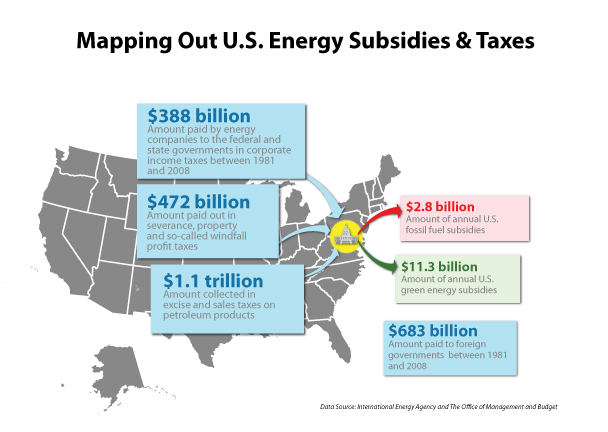 The U.S. offers few energy subsidies, despite being a major oil-producing nation like all the nations ranked by the IEA as the most profligate subsidizers of energy. As a percentage of GDP, U.S. subsidies are miniscule. Even when measured in dollars, a type of ranking that would be expected to push the U.S. up when compared to less wealthy nations, fuel subsidies in the U.S. do not rank in the IEA’s top 25. Only in rare cases have price ceilings on fossil fuel consumption been seen in the U.S., even though they are an internationally common method of subsidizing fuel consumption. Generally, the U.S. and other industrialized nations allow the price of fuel to rise with the market, a practice that deters over-consumption. There are some, however. When the market price rises rapidly, as happened during the supply disruption caused by Hurricane Katrina in 2005, some state governments in the U.S. have imposed price ceilings. Also, the federal Low-Income Home Energy Assistance Program funnels money through state governments to residents who apply to the program for payment of their heating and cooling bills. On the production side, the federal government does provide some subsidies to fossil fuels. Those would include direct outlays such as the government’s geological research, and on the tax side it would include any tax treatment of fossil fuel profits that is more generous that the ordinary treatment of corporate profits. As previous Tax Foundation research has shown, such tax breaks total approximately $2.8 billion per year. The opposite of a government subsidy is a tax, and governments in the U.S. collect an impressive amount of tax revenue from fossil-fuel energy companies each year. Between 1981 and 2008, the oil industry paid more than $388 billion to the federal and state governments in corporate income taxes and almost twice that amount, $683 billion, to foreign governments. Excise tax collections have grown steadily. Between 1981 and 2008, $1.1 trillion was collected in excise and sales taxes on petroleum products. In 1999 governments collected $59 billion, more than twice the industry’s net profits that year. In severance, property and so-called windfall profit taxes, the industry paid more than $472 billion over that 27-year period. Although a tax exemption does not reduce fuel prices below the market price, it does provide a comparative price advantage. When large consumers of fossil fuel energy are granted significant tax exemptions, consumption must rise at the margin. In the U.S., state and local governments are among the largest consumers of fossil fuel energy, and they enjoy some tax exemptions, notably from the federal gas tax. By lowering the price for police cars, school buses and other government vehicles, federal government policy is stimulating consumption. The United States offers little in the way of fossil fuel subsidies, compared to other nations, as the IEA reports. The demands from the Administration and its allies in Congress, then, for eliminating those subsidies seem out of proportion to the issue. The Administration should focus on making the U.S. more competitive for corporate activities instead of targeting energy firms for punitive tax treatment. International Energy Agency, World Energy Outlook, November 2010.
 International Energy Agency, Organization of Petroleum Exporting Countries, the Organization for Economic Cooperation and Development, and the World Bank, Analysis of the Scope of Energy Subsidies and Suggestions for the G-20 Initiative, June 16, 2010, http://www.worldenergyoutlook.org/docs/G20_Subsidy_Joint_Report.pdf. 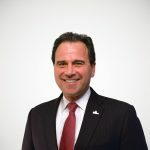 Hodge, Scott A., “Putting Corporate Tax Loopholes in Perspective,” Tax Foundation Special Report, No. 184, August 2010, available at http://www.taxfoundation.org/files/sr184.pdf. Hodge, Scott A., “Oil Industry Taxes: A Cash Cow for Government,” Tax Foundation Special Report, No. 183, July 2010, available at http://www.taxfoundation.org/files/sr183.pdf.